I'm new to the wonderful world of runDisney, but I feel pretty confident that I may have passed the most stressful and toughest part of the experience - registration. runDisney races are extremely popular and often fill up fast. I knew all of this going into the process, but wasn't quite prepared for just how quick the race would fill up. Here is my experience with registering for the 2015 Wine and Dine Half and Jingle Jungle 5K as well as tips that might be helpful for those of you looking to register in the future. Registration begins at Noon (Sharp!!) - On the day that registration opens, you want to stop everything you are doing and be prepared to register at noon on the nose. 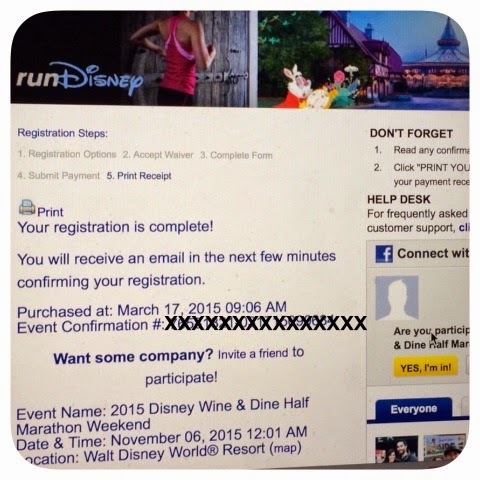 I went to www.rundisney.com at noon and immediately hit the "register" button for the Wine and Dine Half. 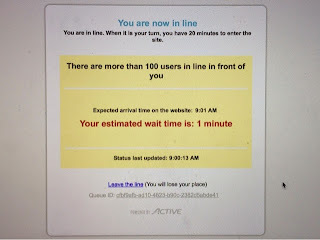 It took me to www.active.com where I entered the queue to wait for my turn to enter registration. Initially, I was told it would be a one minute wait, but the number kept changing. 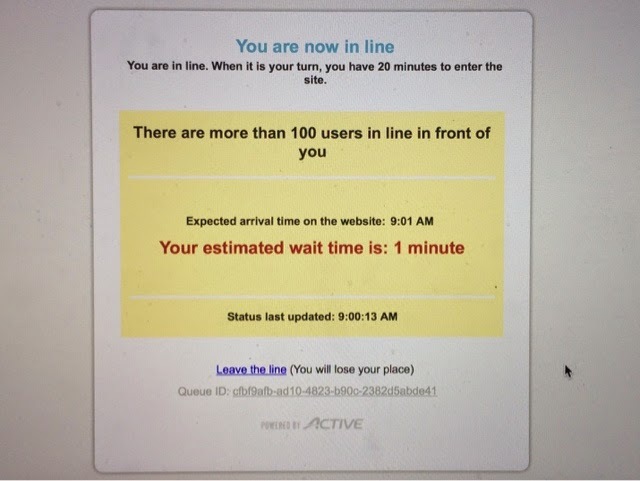 It was about 12:04PM when I entered the Active registration and began. This year, both the Wine and Dine Half Marathon and the Jingle Jungle 5K sold out in less than 44 minutes - that's CRAZY!! Just keep waiting, waiting, waiting. . .
Prioritize - You can only register for one runDisney race at a time. Since the half marathon was my big goal for this weekend, that's what I selected to register for first. I didn't have an account on Active so I began registration as a guest. I don't think it really slowed me down - maybe took me an extra 90 seconds to enter the information that they would have already had. After completing registration for the half marathon, I then went back and started over again to register for the 5K. When prioritizing your races for registration, remember that challenges often sell out first. The kid's races are usually the last to sell out so save those for after you've already met your other priorities. Credit Cards Ready - Have your information ready to go so you can roll through registration quickly. I read a number of stories of people who were in the middle of registration and then got booted out because the race sold out. You don't want to miss out on your race opportunity because you can't find your credit card. Registering a Group - This can be tough. Since runDisney races can sell out in less than an hour, getting a group of people registered can be tricky. Option 1 would be to have one person try to register everyone. This would be slower and may mean that everyone won't get in. The other option is to have everyone log in on their own and try to register. However, there is still no guarantee that everyone will get in. Our plan was a group of 3 runners for the half and 4 runners for the 5K and we had decided everyone would be on their own to register. I got in for both races and so did one other person in our group. The other two unfortunately didn't make it in for either race. Again, I read a lot of stories online about husbands and wives or groups where one person successfully registered, but the others didn't which can be disappointing. Remember that runDisney races are nonrefundable and nontransferable so make sure you're OK running if the rest of your group doesn't get into the race. I have been so excited thinking about running my first half and my first runDisney race which made me really nervous on registration day! After surviving the stress and nerves and flying fingers on my keyboard to get registered, I think running 16.2 miles in less than 24 hours will be a piece of cake, right?? Sounds like a fun time with family! Happy training!